Includes everything toy related for dogs. While on a trip visiting family in southern California a few weeks ago my mother did her due diligence and paid a visit to a locally owned pet store in the area. At this particular store she found quite a few new toys to try out on our pups, but the one that made the cut (and the trip out of the store and back home) is a red, hard rubber chew toy from the company SPOT. The toy is rather large for a chew toy; it certainly has a little more surface space when compared to similar Kong toys. It is, like I mentioned, made of pretty hard rubber, so it is not immediately flexible or bendable, which is actually a good thing. 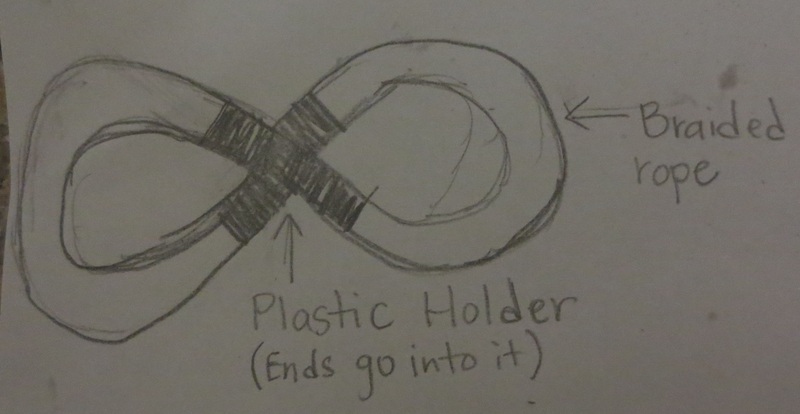 It also has three different ends on it, with holes in each end so that (as the packaging states) it can easily float. It’s seemingly durable construction means that the toy is actually a little heavy, so not the best toy to throw around without care. It has become something of a delicate balance that needs to be reached when it comes to chew toys for Simon and Rosee. You see, they are strong chewers. Simon cannot be left alone with Kong rubber toys because his teeth can tear apart a brand new toy in just a few minutes. By now he knows the weak points on all of the toys (specifically where the different parts are glued together) and he shamelessly exploits them, tearing apart these toys ridiculously easy. However, Kong toys because they are lighter and bounce pretty well make for very good toys to play fetch with. Simon, and Rosee when she deigns to grace us with her cooperation, loves to chase after these toys for at least a solid thirty minutes every evening. It’s just a little costly to constantly be buying new Kong toys every time Simon is able to tear an old one apart and the separate pieces get to be too small and torn up in order to use safely anymore. So, finding this new rubber toy by SPOT has certainly been an interesting development on the rubber toy front. The packaging on the toy that we got even states that this particular brand is “virtually indestructible” and is made for “tough chewers.” To sweeten the deal the toy only cost $15. Some of the other heavier duty chew toys we’ve found have always been upwards of $20, so finding this SPOT toy for cheaper is definitely a plus. The best part though? The toy comes with a 100% Lifetime Guarantee! If your toy breaks of is chewed up you can take it back to the store and get a new one. Clearly, this toy has all the makings of being a really good buy. The true test will be to see how long exactly the toy stands up against Simon and Rosee’s play time. Lots of toys in the dog world claim to be indestructible and for powerful chewers, but most are considered good buys if they last at least a month in our house. So, over the next few months (hopefully!) 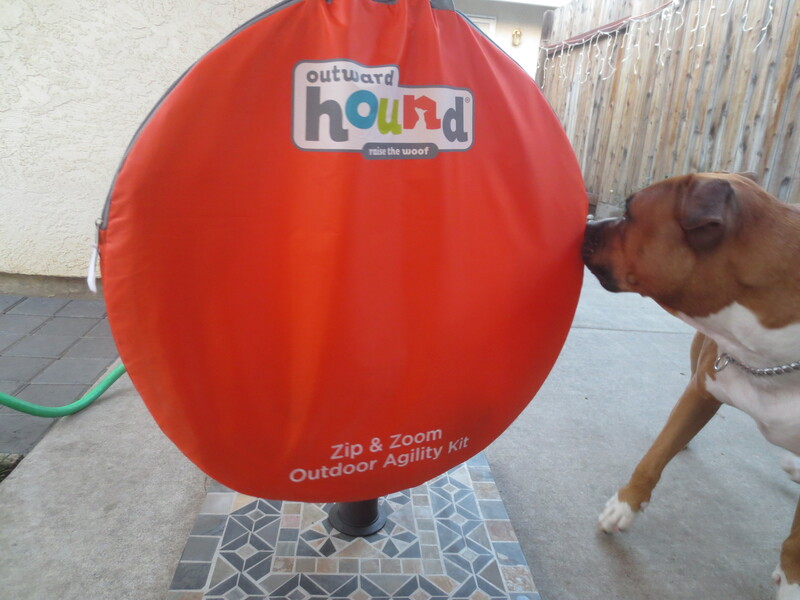 we here at Play Hard Bark Often will be keeping tabs on SPOT’s chew toy and reporting how exactly it is fairing, doing our best to test how indestructible this toy really is. We have high hopes after all, and not just because of the Lifetime Guarantee or because of the heavyweight rubber it is made out of, but because it has already been a week and so far after many rounds of fetch, chase, and just straight up chewing the toy has only a few scratch marks and teeth marks. Not bad for one week’s worth of play. But is it just early success? I don’t know, but I can’t wait to find out! Check back in next week to find out how Week Two went. Recently, I made sort of a whim of a purchase. 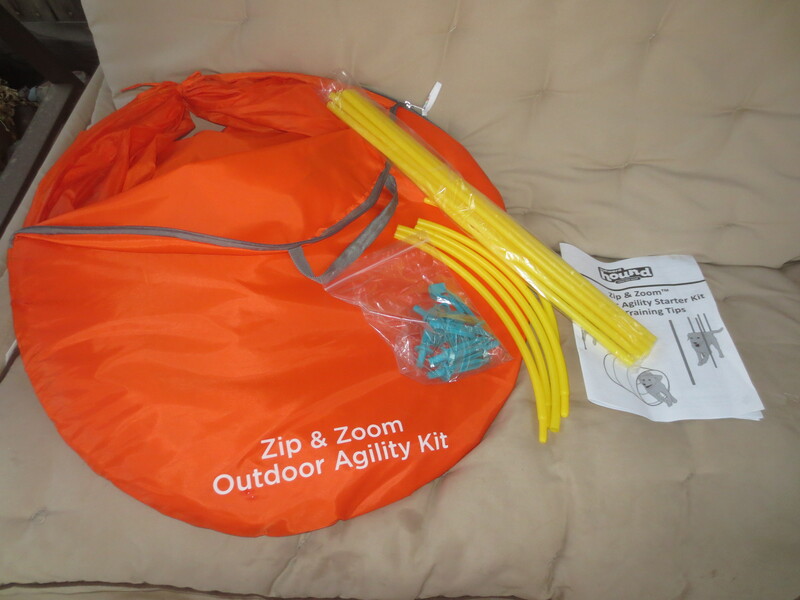 I was walking around Petco and saw the Outward Hound Zip and Zoom Outdoor Agility Kit, and immediately thought it was pretty cool. 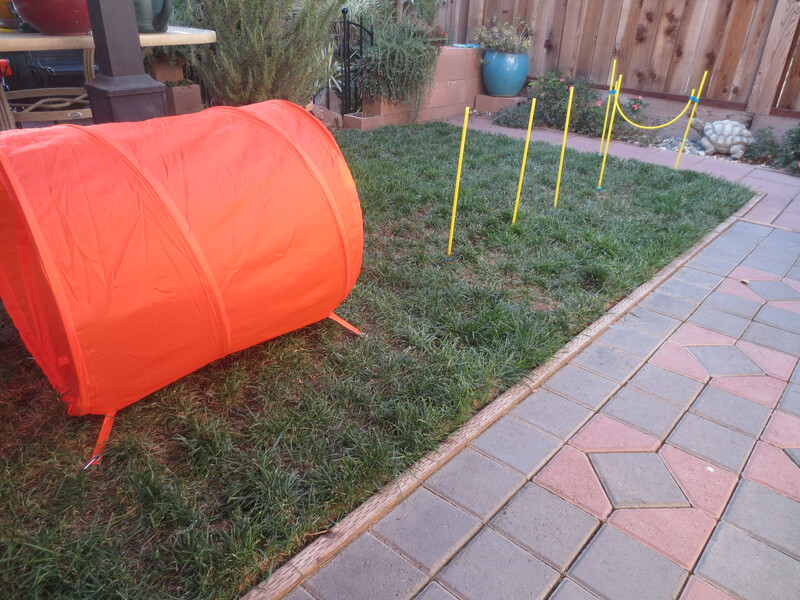 I mean, the agility course comes with three obstacles and in a handy carrying case. Really, how could I pass it up? I must admit though that I almost did pass up buying it due to the price. It was $50, which (to me at least) seems awfully expensive for something that comes in such a small bag and was not very heavy. Yet, I wanted it. I wanted it because it’s not something I’ve ever seen before. 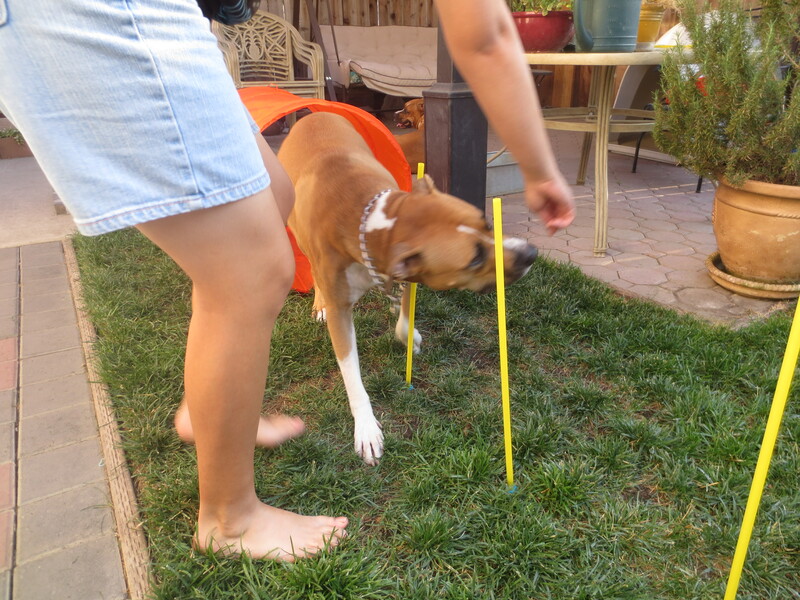 Of course, I have looked into dog agility courses previously, but besides books that cover building one’s own course or simply assume that the course pieces are easy accessible, I haven’t found an actual kit with pieces. Unfortunately, I am neither crafty nor handy enough with tools and such to build my own course obstacle pieces. DIY-er I am not. Still, I’ve wanted to try doing agility with Simon and Rosee for a while. 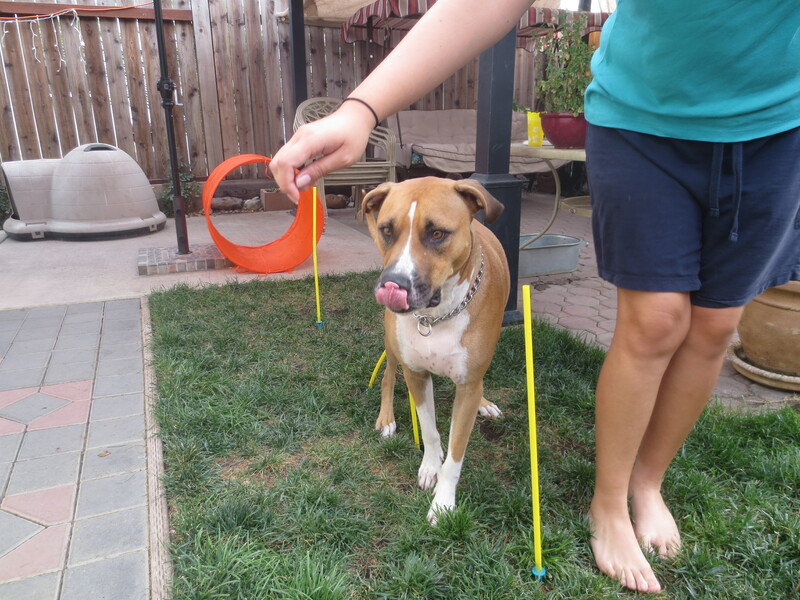 Along with being a good form of physical exercise, agility training can also be mentally challenging for dogs, which is very good for dogs like Simon. 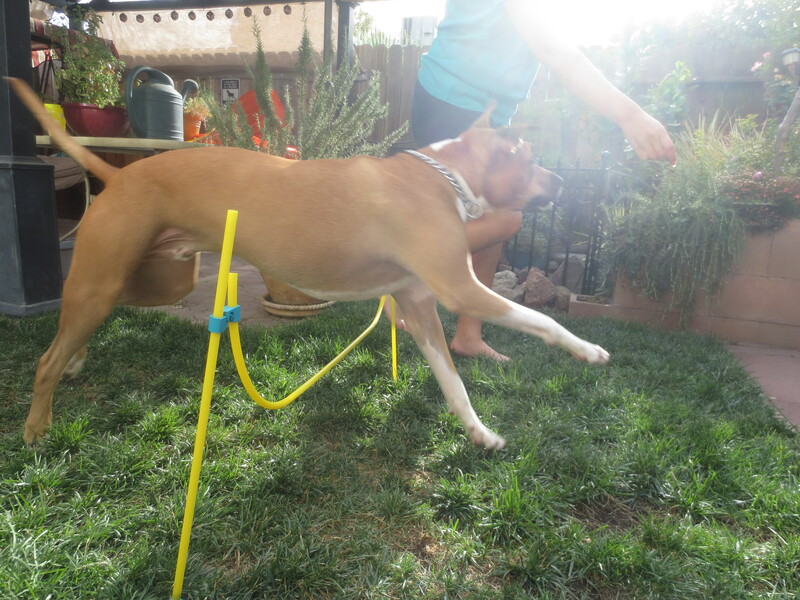 I do know that actual training classes for agility are out there, but there’s really no class available close to us and these classes typically require your dog to listen to you well off leash. Regrettably, Simon does not listen so well off leash because he finds everything and everyone else he encounters more interesting, which is why he is only allowed off leash when we go to a dog park. Rosee is pretty similar, and, well, she is very lazy. If left to her own devices she’ll mostly choose to lay down and take a nap. She doesn’t like to exert herself if she doesn’t have to, and I can imagine she would decide to lay down instead of listen to me. Also, training classes can be expensive, and I wanted something that we could all do at home on our own time. 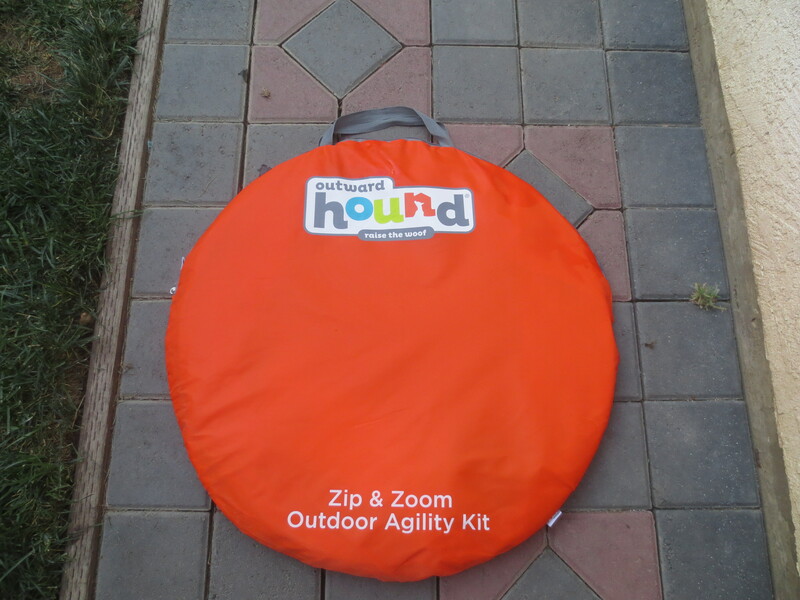 As a result, I broke down my initial misgivings and decided to buy the Outward Hound Agility Kit to try. 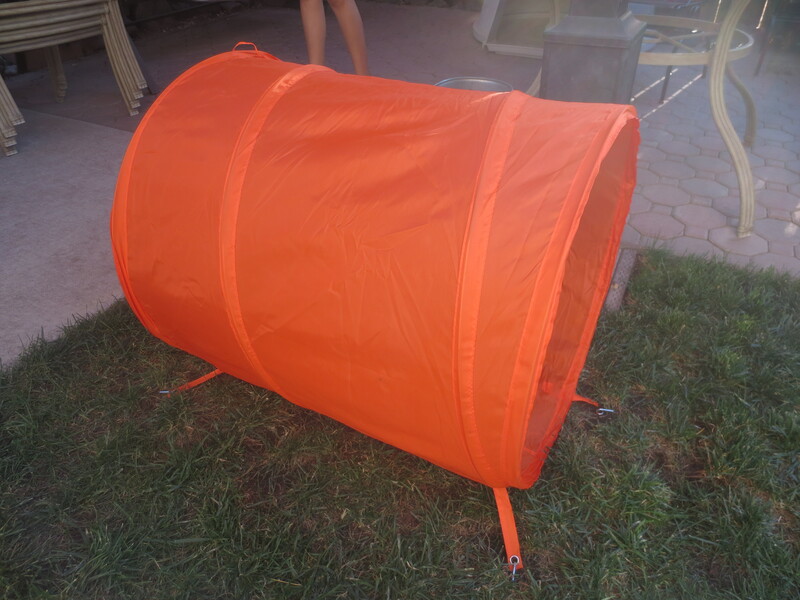 The kit comes with three obstacles: a tunnel, weave poles, and a high jump. It seemed like a pretty good deal at first, and very good for a beginner like me who doesn’t know too much about agility. I know the basics from watching the annual dog agility competitions, but, really, that’s not a whole lot. 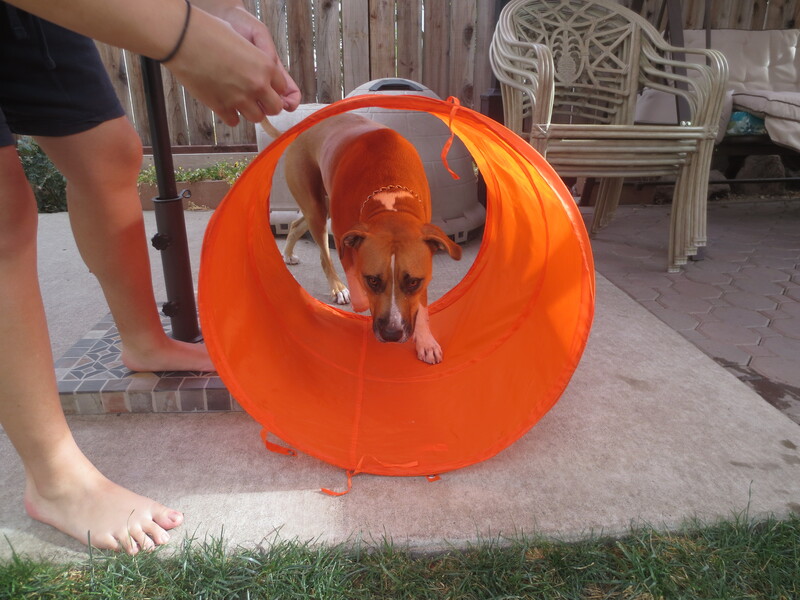 Luckily, this kit comes with a handy-dandy instruction manual along with a tunnel, eight poles (six for weaving and two for the jump), and several curved pieces that create a circle in which your dog is supposed to jump through. There are also metal spokes included to hold the tunnel down, stakes to attach to the poles to stick them in the ground, and clips that attach the circle-hoop jump to the poles that hold it up. It’s all fairly easy to set up, and can easily be taken down and packed away when you’re down. I like the fact that it comes in a case because it makes storage easy and all the pieces can stay together so as to avoid losing any of them. Now, I have to brutally honest here. While I may have initially liked the idea of this product, the actual product is kind of a letdown. The tunnel is awfully short, maybe three feet long. 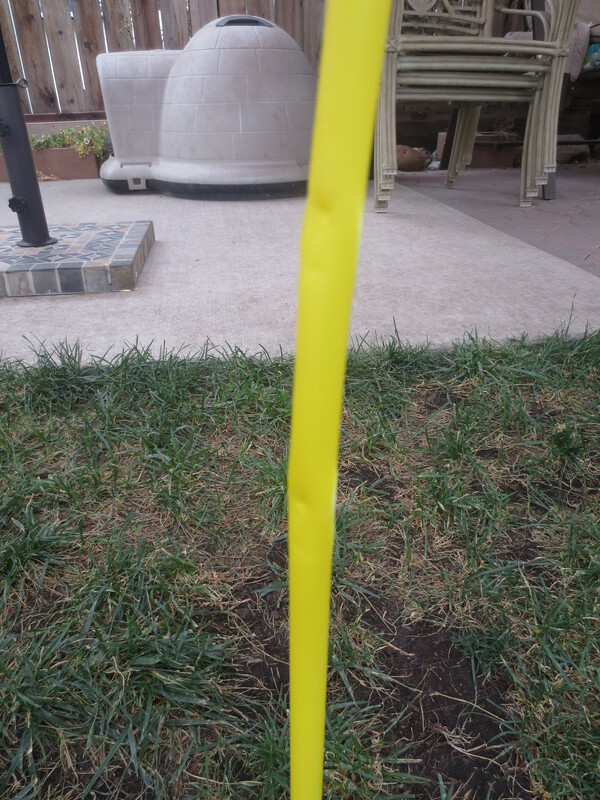 The poles are made of very thin plastic and tend to fall down when a gust of wind hits them, let alone a 75 lb. dog. In fact, after setting up the weave poles Rosee decided she wanted in on the action and stole one. The plastic was so thin that just by her carrying the pole around in her mouth left it dented. She didn’t bite down, but rather simply held the plastic piece in her mouth, and when she dropped it it had two pretty serious dents—pretty disappoint. 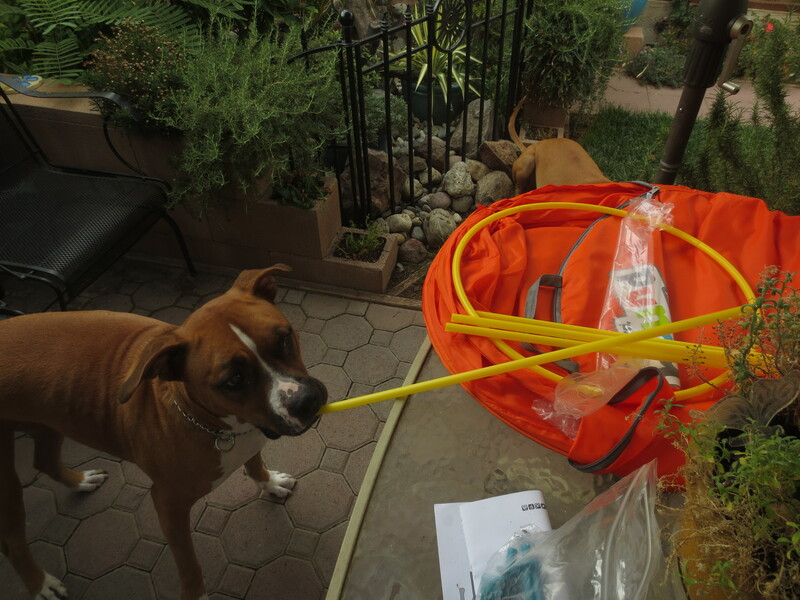 Lastly, the circle-hoop is barely big enough for either Simon or Rosee to jump through, and some creative problem-solving was needed to create a jump that was actually usable. 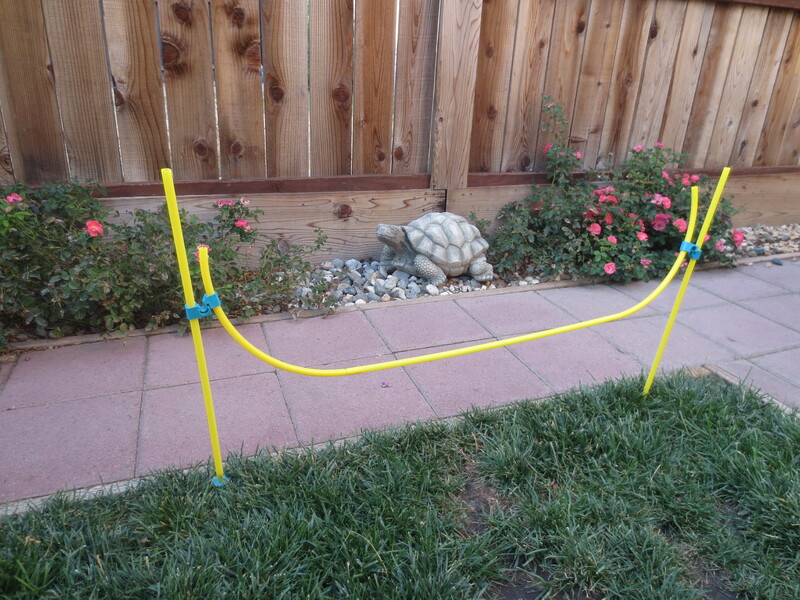 I actually had to take one of the weave poles and attached curved pieces to each of the ends to make a high jump that could accommodate Rosee and Simon. Plus one of the tails from the tunnel that is used along with a metal spoke to attach the tunnel to the ground ripped way too easily. Seriously, all that happened was Rosee went through the tunnel and when she came out she hit the end and the tail ripped. Tunnel tail with metal stake to hold it down. The metal grommet ripped right off of the tunnel tail. Despite all of these issues with the agility course I do have to say that Simon and Rosee along with us humans have had an awful lot of fun with it so far. The course is not very big, but for the size of my backyard that’s okay. 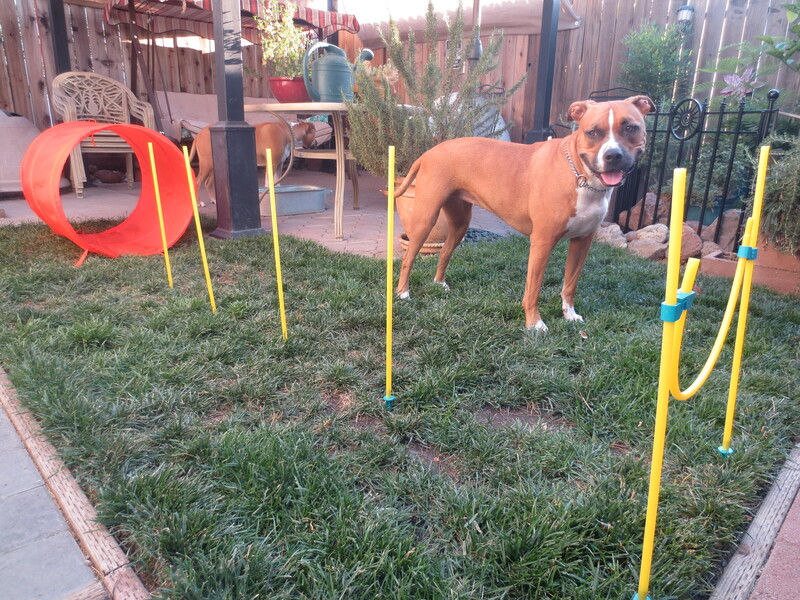 It fits on our small patch of grass, and is long enough to be good exercise. However, it’s not too long and overly complicated so as to have either Simon or Rosee become bored and run away to do something else– which Simon totally does by the way. Overall, I would recommend this product, but only if you happened to find it on sale or maybe you have a coupon. Frankly, I don’t think that it’s worth $50, especially considering the quality of the course pieces and the fact that it’s not really made for large dogs. There should be a recommendation on the tag that says for small to medium sized dogs (just my opinion, of course). Nevertheless, it is easy to use, to store, and has been fun to use so far. She just loves it so much she can’t wait! Like most good stories start: I was at the pet store with my mother. We were only supposed to be picking up a bag of dog food for the month, but the course of certain plans never does run smoothly. We quite easily found ourselves perusing the toy aisle, readily agreeing that Simon and Rosee haven’t been subjected to new bones in a while, and shouldn’t we get them two extra Kong toys just in case they rip the ones they already have, and oh, they also could use some extra bags of treats too since we’re here anyway. So, after getting a cart (because we just didn’t have enough hands between the two of us) and picking out a few new Nylabones and filling up two big bags with dog biscuits we started to make our way towards the checkout. Of course, this path meant we passed by a rather lively display of rope toys. Now, I know what you’re thinking. Rope toys? I thought tug-of-war wasn’t a good game to play with dogs? Doesn’t it teach them not to let go? Won’t rope toys shred too easily? Or maybe this is just what I was thinking as I debated with my mother whether or not a new rope toy was a necessary addition to our toy arsenal at home. It’s not that I don’t like rope toys. In fact Simon and Rosee have had a few over the past few years, one of which actually making it in time for this blog (see Super 8 Dog Toy). However, others have not been so lucky. The truth is between two strong dogs that like to pull on and shred rope, rope toys simply have not lasted very long within our household. So, I was reluctant to bring another one home, only to have to throw it out after a few weeks, especially after spending a pretty penny on it. Rope toys may not be the most expensive toys there are, most Nylabones costing more than the largest rope toys I’ve found available, but they still cost enough to make them an investment, unfortunately a bad one based on past experience. 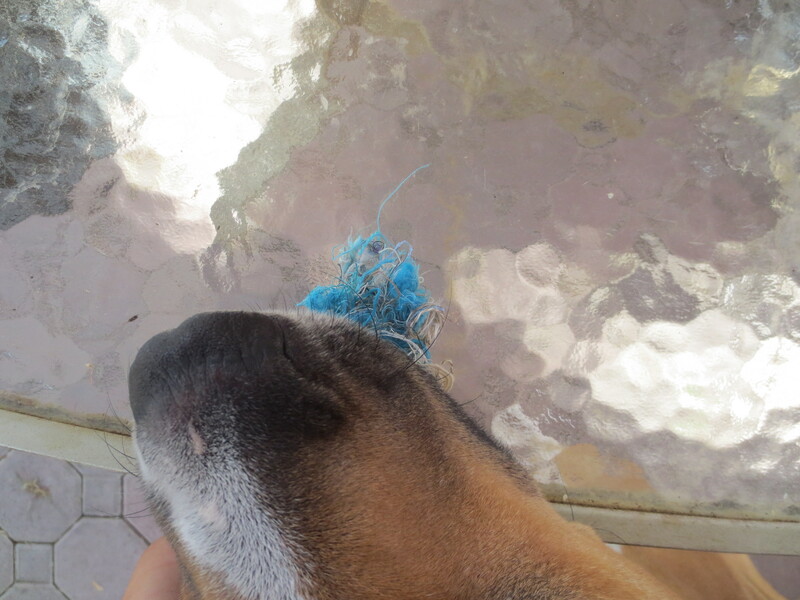 I decided to remain optimistic though, and willingly placed a large blue and silver rope toy in our basket. Rope toys are not all created equal, so the rope toy that I purchased is made by Mammoth, who calls the toy a Flossy Chew. It cost about $18, so not too expensive (Nylabones cost more at about $22 for the largest ones). This is one of the strongest and thickest rope toys I have come across in my three years of owning dogs, and I’ve looked through a lot of rope toys. This particular Flossy Chew is approximately 48 inches long with five knots. The color of chew my family bought was made up of blue and silver threads. There were other colors available, including a white and purple one that almost grabbed my attention. Initially, the Flossy Chew looked beautiful, pristine, and totally wreck-able. Patience has never been one of her virtues. By now, it’s been a few weeks and I have to say the toy is holding up quite nicely. Of course, the two only get to play with it for about fifteen minutes once or twice a day, and are heavily supervised the whole time. If not, then Rosee takes one end, Simon the other and both of them simply use their teeth to pull on the strings, shredding them to the best of their abilities. The front room becomes littered with string and looks more like a blue and silver explosion instead of a friendly game of tug-of-war. This mess isn’t such a big deal, but Simon likes to try and eat the leftover strings and that isn’t good for him, so it’s important to quickly scoop up any remnants right after a play session. As he steals my pile of shredded threads. Also, without supervision Rosee just goes to town, making it her personal mission to pull apart the glued together knots. You can just hear the ripping and she wages war on the tiny threads. Obviously, she is not left alone with the toy or allowed to really just sit with it. When Simon decides he doesn’t feel like running after her or tugging on the other end of the rope, it ends up falling on mine and Theresa’s shoulders to keep her running around the house so she doesn’t have a chance to rest and shred. The truth of the matter is as long as the two are using the rope to actually play tug-of-war (or just tease each other), then everything is good. Her first five minutes with the toy. Simon and Rosee are very adept at playing and knowing when to stop when things start to become too rough, usually when Simon’s starts barking too much and Rosee growls a little too loudly. When this happens the treats come out and the Flossy Chew is taken away. The two of them take a moment to realize that even though they only ran around for fifteen minutes or so they are exhausted, and I get another hour of downtime as they fall back asleep. So, I would say the toy was a good buy, as long as it comes in moderation and with adequate supervision. 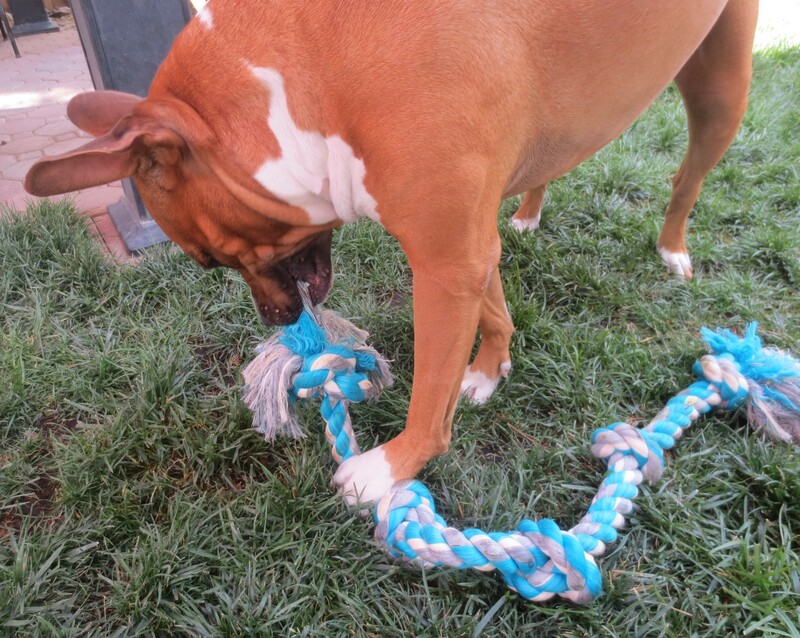 As the evidence shows a Flossy Chew, or any other rope toy, can be a fun and effective toy as long as certain practices are in place. Supervision is a must if your pooch likes to shred and swallow like Rosee and Simon do. Moderation is also crucial if your dog likes to shred, otherwise the toy wouldn’t last a week. It is prudent to make sure your canine doesn’t get too caught up in the game of tug-of-war as well, because that could lead to other problems (like not letting go of things stolen off of the table after a crazy rampage around the front room—I’m looking at you Rosee!). The only claim I cannot judge is that as a Flossy Chew it is easily assumed the toy is supposed to floss a dog’s teeth. I don’t see a difference in either Simon or Rosee’s teeth, but since the toy was not bought for this reason I still find it a good buy. His version of the death roll. The fact is this particular rope toy or Flossy Chew can be a good investment because it does have a sturdy build, made to last through strong chewers and its longer length allows for more places to pull from (and for human hands to avoid pointy canine teeth). I look forward to getting a few more months out of this Flossy Chew, allowing Simon and Rosee an exciting way to play inside and avoid the overwhelming heat of the oven that can be California during summer. Toys. What can I say about toys? Other than the fact that one of the hardest things to talk myself into buying for Simon and Rosee is toys. Not because I don’t want them to have toys, but more so because they go through toys so fast and toys aren’t exactly cheap. (I guess that’s three things, huh?) Combine all that with the fact that both dogs love to chew and what you get left with is a garbage can full of broken, ripped and shredded toys. Even when we specifically buy toys that are labeled “for powerful chewers” they never seem to last long. Otherwise they get bones, which are good options, but they don’t quite hold the same appeal as toys when Simon and Rosee want to play. On the lookout for a good (because perfect is impossible right?) toy Simon and Rosee have developed quite a cache of them. You see, it was fun at first when Simon was a puppy to go to a pet store and buy him various types of toys. Especially with his energy levels I would always look for toys that challenged him and could keep him interested for an extended period of time. As he got older though, the toys needed to be more indestructible. Then Rosee came along, and when it comes to play these days a good toy needs to be difficult to tear apart (Rosee’s favorite pastime) and big enough for tug-of-war. Am I expecting the impossible? Yes, because most toys are not completely indestructible, but I at least wanted some dog toys that would take longer for Simon to tear apart than a few minutes. Now, what I mean when I say “toy” here is something that Simon and Rosee could play with. 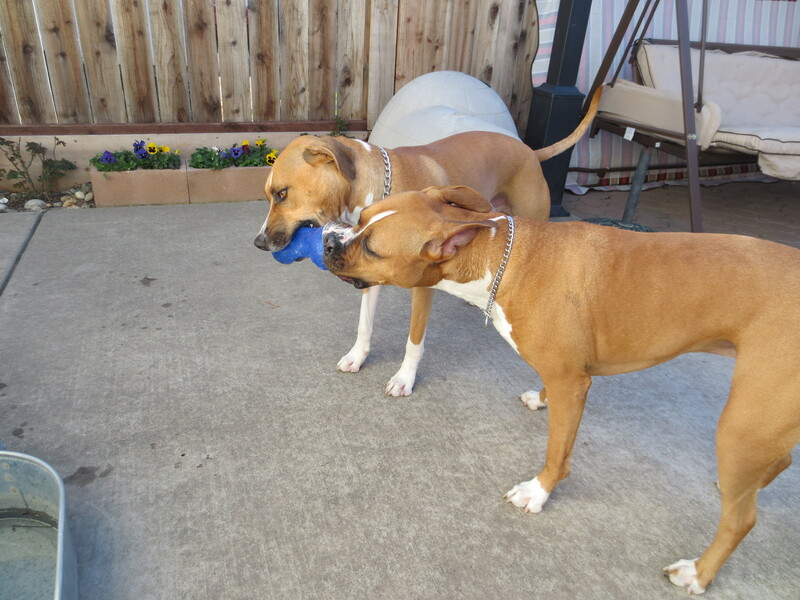 Something either of them could play fetch or catch with (although not so much Rosee who prefers being chased), chew on safely for a little while (but not too long since the function would be for play), and something that wouldn’t break it they both tugged on it together. Recently, I came across these Kong Squeezz toys. To be honest, I mostly noticed these toys because they were on sale (can we say 2 for 1!). I thought, since these toys were rather inexpensive, it wouldn’t matter much if Simon and Rosee destroyed them quickly. At first, I wasn’t sure which type of toy to get as there are several different shapes including a regular stick shape, a dumbbell, a bone, a ball, and a ring. I stuck with shapes that would be big enough for both dogs to grab a hold of at the same time, and that I could easily get out of their mouths (this was before they really learned “drop it”). Right from the beginning Simon was in love with his Kong Squeezz toy, and wouldn’t really play with anything else. Every morning he would sit at the laundry room door, since that’s where I keep their toys, and wait for someone, anyone to give him his toy. Once he got his toy, it was like nothing else existed. The rings are his favorite because he can put his mouth through it, and maintain a strong grip. However, the dumbbells tend to have better squeakers, which he loves to squeak endlessly. 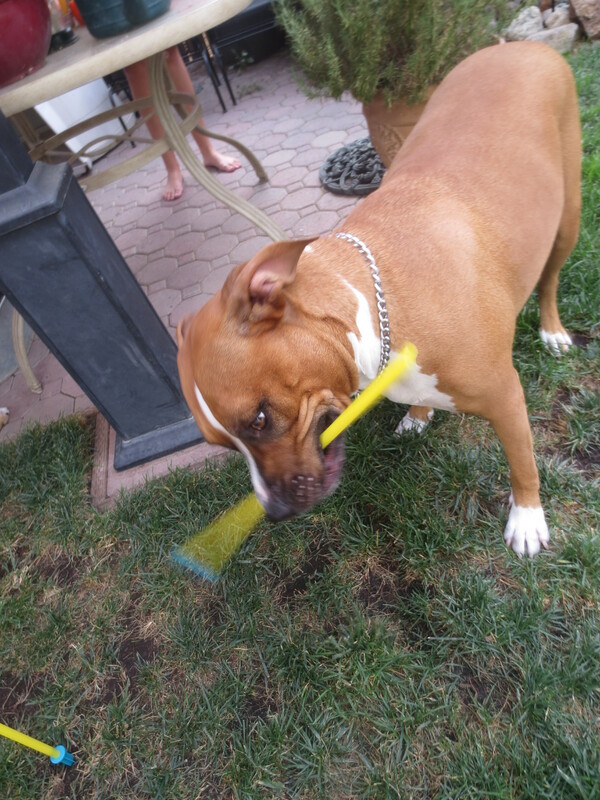 Rosee, on the other hand, enjoys her Kong Squeezz, but mostly likes to try and take Simon’s toy. Now, there is one important thing I learned about these toys that I should probably share (even though it’s kind of gross). While I don’t recommend letting your dog ingest anything that isn’t edible, I would like to say that (based on my own experience with Simon and Rosee) Kong Squeezz toys can be passed (I assume you understand what I’m trying to say here). One of the reasons Rosee and Simon like these toys so much was because they could pull on them. You know, hold it down with their paws while they pull at a spot with their teeth. If they’re left alone a little too long with one of these toys (which we don’t do anymore) it pretty much ends up in pieces. Unfortunately, Simon has developed a fondness for eating the soft rubber pieces he pulls off, hence how I know it can be passed. Rosee, thankfully, just spits the pieces out and continues to destroy. As of now, they only get to play with these toys if they’re supervised, but since we mostly use these toys for play and not to chew it’s okay. 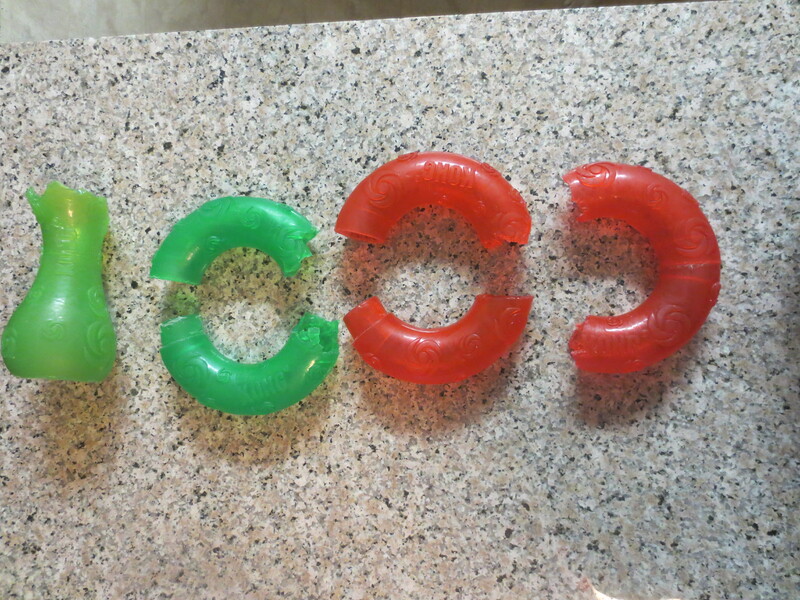 Generally, I like these Kong Squeezz toys because they come in a variety of shapes, are fairly indestructible (unless it’s used exclusively for chewing then it won’t last too long), are really great for playing fetch, and they almost always seem to be on sale (at least at the pet stores I shop at and I always stock up). Now, I have to admit that I don’t really like (read: absolutely loathe) squeaky toys, but Simon does and luckily the squeakers in these toys never last very long. This might be a downside to some, however I don’t mind the squeaker only lasting a week or so (that’s with regular, everyday use). Also, I probably wouldn’t recommend leaving your dog unsupervised with a Kong Squeezz toy just because it’s not really a chew toy, and if your dog is anything like Simon and Rosee it will only end in a ruined toy. Still, I really like using this toy to play fetch with Simon, and Rosee and Simon enjoy using it to play tug-of-war. 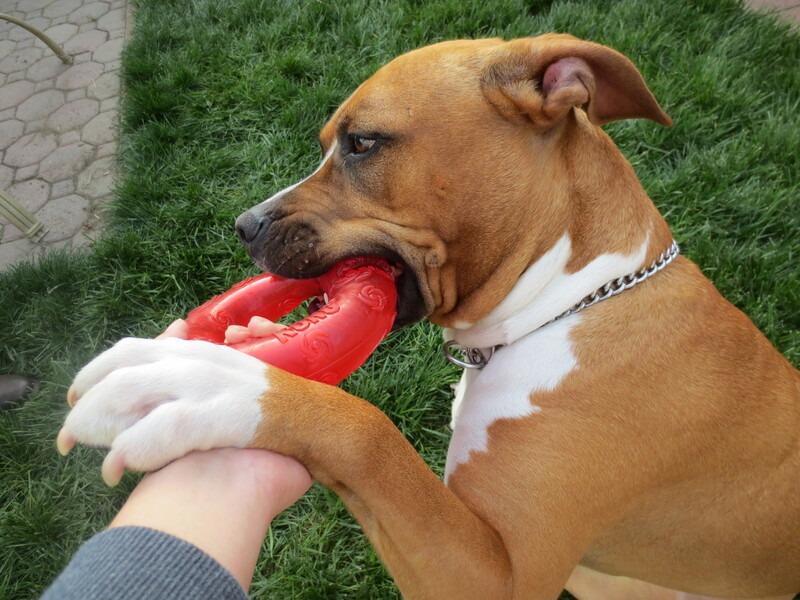 For these main reasons, I would definitely recommend the Kong Squeezz toys to any dog owner. When I first saw this toy I thought it would be the perfect rope toy for Simon and Rosee. 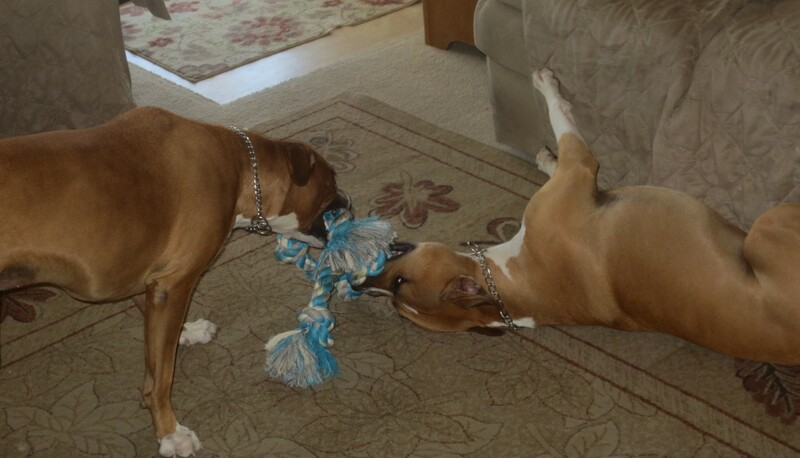 They both love playing tug-of-war with each other, and had a more traditional type rope toy previously, but after quite a few months of playing with the toy it was pretty much falling apart. Pieces of the rope began falling out and left behind every time the dogs played with it, and after a while it became apparent that a new rope toy was needed. While I did like the more traditional type rope toy because it was pretty sturdy, lasted a fairly long time, and was a toy that both dogs could play with and grab a pretty big piece of to hold, I wanted to see if there was any other rope toy that didn’t have the exposed ends. Simon and Rosee enjoy chewing on these ends a little too much, and before you know it there is a huge mess of strings on the floor. Therefore, when I found this toy I thought I’d try it because the dogs could still have the fun of playing with a rope toy, but I wouldn’t have to worry about vacuuming up the mess afterwards. Unfortunately, this wasn’t exactly what happened. Now, being that both Simon and Rosee average about 70 lbs. a piece, when they tug it’s a pretty hard tug. So, I knew that this toy wasn’t going to last forever. I mean, I am realistic about the longevity of toys in this household, although I do expect certain types of toys to last at least a month or two at the very least. I definitely expected it to last more than just a few minutes, and I especially thought it could withstand more than a gentle tug. It seemed that almost immediately after giving Simon and Rosee this toy for the second time one end popped out from the middle plastic piece after, and again I stress the words, a gentle tug. Unfortunately at this point, this was the end of the rope toy. Similar to what happens when you pull on a loose thread on a blanket or sweater and then before you know it the whole thing unravels…well that’s what happened to this toy. Once one end was pulled out it didn’t take long before the braided parts were unravelling, strings were falling out, and the other ends came out of the middle plastic piece. To say that this toy was a disappoint is kind of an understatement. However, I feel that this toy’s biggest flaw was that the rope ends that were simply glued into the middle plastic piece. It was way too easy for the ends to be pulled out, and because of that it was way too easy for the whole thing to fall apart. Overall, this is not a bad toy, but definitely not one for “powerful chewers” or for dogs who really go for it in a game of tug-of-war with each other. If your dog happens to be a light chewer and is more of a “chase me while I have the toy” (this is Rosee’s type when people play with her) type then this could be a good toy for them. Regrettably, this toy did not work out for Simon and Rosee, and I’ll probably just stick to the more traditional rope toys for now.